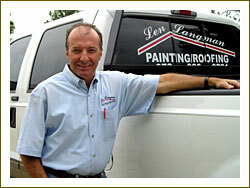 Welcome to the Web Site of Len Langman Painting & Roofing! Welcome to Len Langman Painting & Roofing, serving your painting and roofing needs. We service The Colony, Frisco, Plano, Carrollton, Lewisville and surrounding areas. If you have experienced hail damage to your roof, or if you are selling or purchasing a new home and need a roof repair or replacement, call today for a free estimate. Whether you're moving to a new location, or bringing important guests into an old home or office, always remember that first impressions count. It is important to realize that the appearance of both exterior and interior furnishings will leave a lasting impression with anyone who sees it. Don't settle for a painting company that provides inferior quality at rock bottom prices. Here at Len Langman Painting & Roofing, we specialize in the kind of quality finish that’s both affordable and durable. Your friends and family will no doubt be amazed at the long-lasting beauty that your home will enjoy for years to come.